Rointe delivers comfort whilst at the same time, balancing the scales of economy. They are renowned for developing cutting edge smart controls. To help them to achieve this, they combine the latest technology with electric heating. This then produces improved efficiency and performance. Their products allow all home owners to experience the joy of luxurious heat but at an affordable cost. This long term vision has all been achieved through intuitive and intelligent design. Founded in 1985, it was born out of a desire for maintenance-free central heating system. Since then, they have developed their product range to provide the most comfort with some of the best energy saving technologies. They constantly strive to stay ahead of the competition and this shows with their latest innovation, the ‘One Complete System’. The "One Complete System" allows all of their heating products to work together to learn the heating requirements of your property. They aim to reduce running costs for the customer and to lower the impact on the environment. This is done with a great design, then some of the latest energy saving technology and then some smart functionality. Their products offer extensive guarantees and are compliant with up-to-date regulations. This has enabled them to become a trusted brand throughout Europe whilst supplying products to over 25,000 partners. Heater Shop supplies the full range of Rointe products and accessories to customers throughout the UK. With the most stylish and sophisticated products, their collection is diverse and hard wearing which means they're perfect for a range of settings. None of their products need maintenance, they are easy to use and take on a minimalist design style. 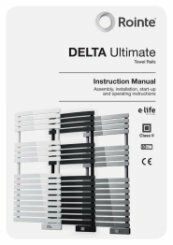 The Designline is one of the most unique radiators on the market. With magnificent marble finishes and a screen display that is able to be changed to suit the desired aesthetic. Their towel rails are unparalleled when it comes to style and functionality. They utilise an oil filled element which provides even heat distribution throughout the whole frame. They can be used individually or with other products and can be programmed for total control. 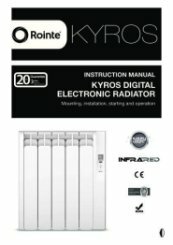 The Kyros range and D Series range include new features such as Open Window Detection, Digital Sensors and Overheat Protection. 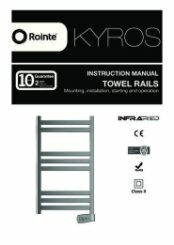 Keep your energy wastage down and your bathrooms warm with a Rointe towel rail. 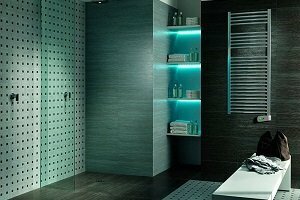 Their range of water heaters are very stylish and some of the most sophisticated products on the market. Their over sink water heaters provide instant hot water which is hassle free. 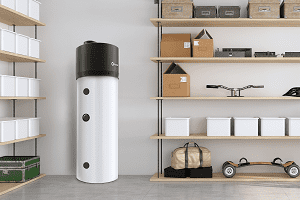 The new Dalis heat pump and storage tank is an all-in-one solution for domestic heating. 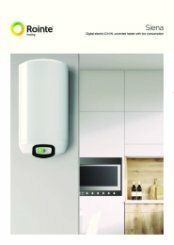 The new low consumption Rome domestic hot water heater kit involves built in Wi-Fi control and real-time consumption information. With improved safety functions and superb control, they are leading the way in the industry. A wide range of Rointe accessories are available to buy. This includes a remote control which offers easy access to either complex or simple functions. Activate the full potential of your home with an exceptional heating system by Rointe. Heater Shop supplies the complete range, the perfect solution for all your domestic heating needs. 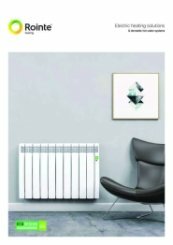 Do Rointe Electric Radiators include a set of brackets? All Rointe Electric Radiators include a set of brackets to attach it securely to the wall, so there is no need to purchase this separately. 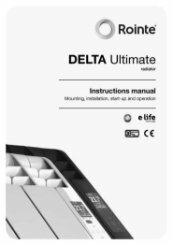 Does the new Rointe Delta Ultimate have an app? 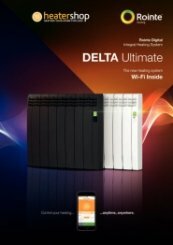 Yes, The new Rointe Delta Ultimate inside WiFi module is built into all of the new Delta Ultimate range, allowing control of all functions remotely with e-life technology through the Rointe Connect App application from your smart phone or tablet, without accessories or intermediate terminals. E-life technology is a communication platform that enables the synchronization of data between a mobile application and heating devices. 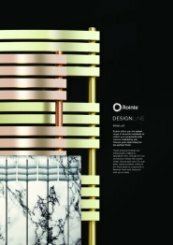 Designed to be easy and intuitive for any user, Rointe Connect App offers many advantages, such as the control of individual Rointe Delta Ultimate radiators and towel rails products or product areas. 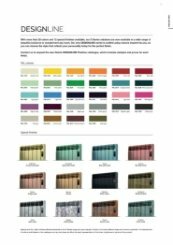 It makes it easy to create multiple facilities, such as your home and business or more and set up as many areas as needed in each of the facilities and as many products by area as you have installed or need to install. In addition, the energy or statistics information screens will offer all the information you need to adjust the management of your heating and hot water system at any time. The Rointe Connect App can be downloaded from App Store and / or Google Play. 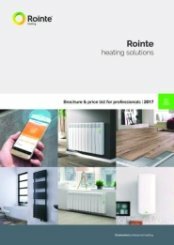 How do I unlock my Rointe radiator? You can lock the control panel from the radiator, the Rointe Connect App or the AIR Control remote (optional). Here we show how to do it from the control panel of the product itself. By pressing the <- and +> keys at the same time for 3 seconds you can lock the control panel. The locked control panel symbol appears and the keys will not respond. A padlock symbol will appear on the screen if any button is pushed. To unlock, press the and buttons together for 3 seconds. 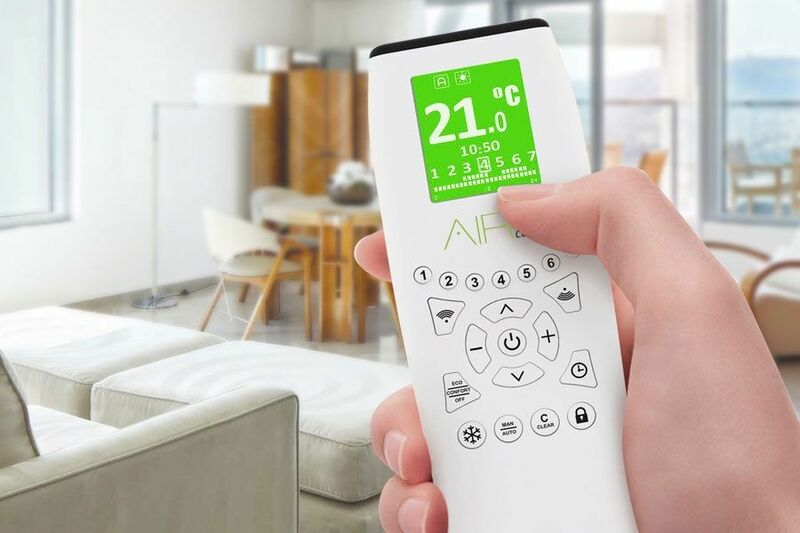 When the radiator is locked from the App or the AIR Control remote, the remote keypad lock will appear on the screen. If any button is pressed, a padlock image with 2 small WiFi waves will be displayed. When the keypad has been locked remotely, it can only be unlocked remotely via the App or the AIR Control remote. How does the Rointe open window function work? The Rointe open window function is invoked when the room temperature sensor detects a drop of 4ªC from the user-assigned temperature over a 30 minute period. Under these circumstances, the function will apply anti-frost mode (8ºC) for 2 hours, reverting to normal functionality at the end of this period, or when the user intervenes by pressing the ON/OFF button. How high do the Rointe radiators need to be off the floor, when installed on to a wall? 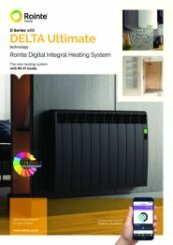 The Rointe Delta Ultimate and the Rointe Kyros electric radiators work by means of natural air convection. 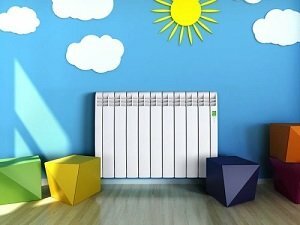 In order to achieve optimal functioning and an even distribution of heat, the lower part of the radiator, once mounted on the wall, must be at least 10 cm from the floor, and 30 cm at the most. As for the sides and above, a minimum distance of between 10-12 cm must be left from any wall or brickwork in order for it to function correctly. What side is the flex/power lead on for Rointe wall mounted electric radiators? The flex/power lead is on the right-hand side for the Rointe K Series, Rointe Kyros and the newer Rointe Delta Ultimate (D Series) ranges of electric wall mounted radiators. Where can I download Rointe heater instructions? 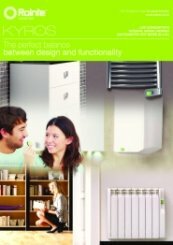 Rointe radiators are designed for household or residential use. We advise to have the radiator installed by an competent person or electrician where necessary making sure the radiator is properly connected and earthed. Our radiators are filled with the precise amount of special oil that does not need any maintenance. Any repairs requiring the opening of the oil tank must only be done by Rointe. You should notify Rointe immediately if an oil leak is detected. The regulations on discarding oil when the heater is being disposed of must be observed. If the power cable is damaged, it must be replaced by the manufacturer or authorised personnel, in order to avoid any damage. Why is the Rointe conservatory electric heater the best heater for a conservatory? The Rointe conservatory electric heater is the best heater for a conservatory as heating a conservatory in the winter can be an issue. Connecting a conservatory radiator to central heating is never a good option as it doesn't meet current Part L building regulations due to the significant heat loss. Rointe conservatory electric radiators are the best option for heating your conservatory as they can be installed easily to low level walls and very low dwarf walls providing the best economical heating. 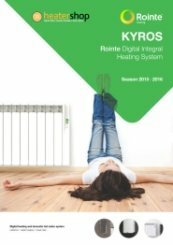 As with other Rointe radiators, the surface temperature of the Kyros range reaches only 40 degrees centigrade when the room temperature is set to 21 degrees. This ensures safety for both children and the elderly, which makes these units ideal for use in either the home or in a public environment. With Fuzzy Logic Energy Control technology the Rointe Kyros conservatory electric heater has an incredibly low energy consumption, and the average power used by the Kyros range accounts for only 39 per cent of the nominal power. Will the Rointe MIC110 work with the Kyros range? The Rointe MIC110 remote control allows you to send and receive programmes between all of the K and T series heaters. These ranges are gradually being discontinued and replaced by the Kyros range. 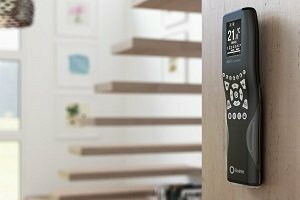 The new upgraded Rointe Kyros ACMI120 Bi-directional wireless infrared remote is available to buy and will allow you to control all products that make up the Rointe heating systems.